National Auto Auction Association member sales approached 10 million in 2016. In 2016, new vehicle sales came in at a record 17.5 million — exceeding the previous record of 17.47 million set in 2015. Used vehicle sales at franchised dealerships increased for the seventh consecutive year to 15 million units. 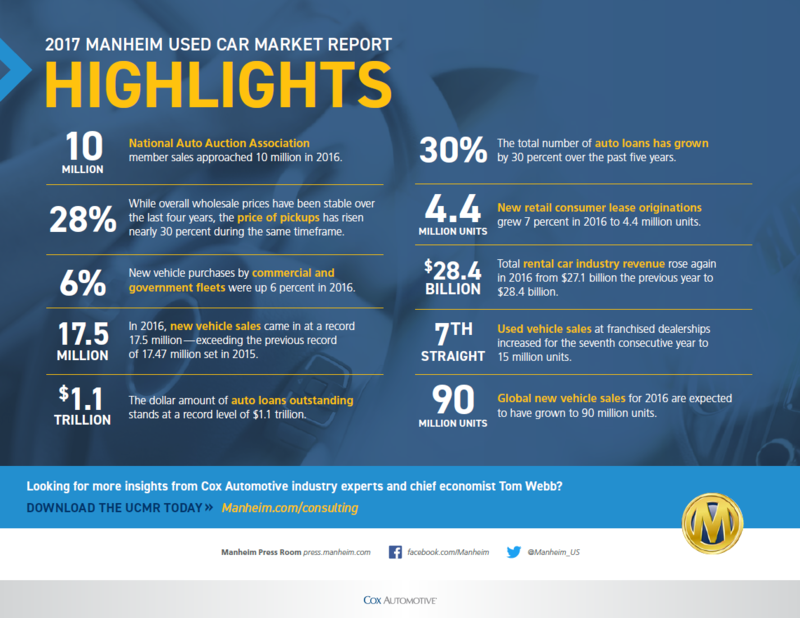 The Manheim annual Used Car Market report examines the economic underpinnings of the entire used vehicle market and sector-specific trends that influence the supply and pricing of used vehicles. This report highlights market conditions and buyer and seller strategies within the used vehicle marketplace, provides an update on digital and mobile technology developments. It also includes an annual look at the various industry components, including dealer, rental, repossessions, leasing, and salvage. While this Top 10 highlight shares the key leanings, you can examine the full report to better understand factors that influenced our industry in 2016, what is projected for 2017 and actions you can take to navigate the road ahead. See the key learnings from 2017.